The dialer is the familiar TouchWiz app and features all the basics - smart dial, quick dial and even a video call button. For extra accessibility, the Home button can be set to answer calls while the Power button can be used to reject them. The call log can be filtered by call type (missed or rejected) and includes messages. The two other tabs in the app show the Favorites and the full contact list. The shortcut to call/message a contact by swiping right/left is gone. Reception on the Samsung Galaxy Grand Prime was good, though not the best we've seen. In-call audio is fairly loud and clear, but there's no noise cancellation so performance will degrade in noisy environments. The loudspeaker proved rather quiet - with the right ringtone you can tease out an average performance, but using it for hands-free speaking and especially for music is a lackluster affair. You can read more about our loudspeaker test, if you have any questions. The Messages app retains a good deal of the features, but it's behind the latest TouchWiz. It shows a list of threads (but no row of favorite contacts) and you get to adjust font size (but no background, message bubble styles). The recent split-screen option for landscape mode is gone too. Anyway, we're clearly dealing with an older version of the custom app. There's an option to schedule the message for later sending (so you can compose it ahead of time), while the built-in spam filter can help you fend off annoying promo texts. 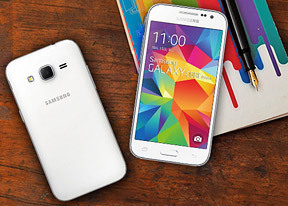 The Samsung Galaxy Core Prime has two email clients - the Email and Gmail apps. Gmail was recently updated to support third-party servers and has Material Design looks, so we use it exclusively. The Email app is the vanilla Android one and it feels visually outdated. The custom keyboard has four rows of keys, with the top row doubling as a row of digits with a long press. The Continuous input option lets you swipe your finger over letters instead of tapping them.You need to enable Predictive text for that to work. The keyboard can learn from your messages and list of contacts to improve its accuracy. An alternative input method is voice dictation. Handwriting recognition is not onboard. Good thing that Android makes it easy to install a third-party keyboard if you're missing functionality.